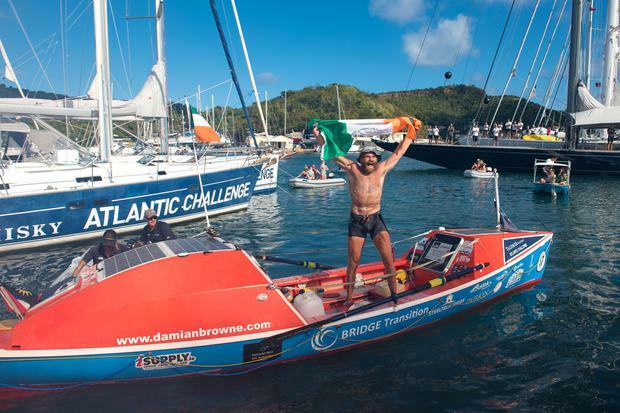 Former Leinster star Damian Browne has completed an epic solo voyage across the Atlantic Ocean. Browne, 37, crossed the line after a grueling 63 days, 6 hours and 25 minutes - rowing 3,000 miles from La Gomera, Canary Islands to English Harbour, Antigua in the world's toughest row. Browne endured physical and mental challenges along the way in the Talisker Whisky Atlantic Challenge to complete a journey that "will live with me forever". Browne faced 40 foot waves and capsized twice during the challenge in the middle of the Atlantic but found the energy and strength to conti8nue each time he was knocked down. "It's really tough as I kept getting pushed back towards land, and I'm very grateful that I found the determination to keep rowing," he said. "There are loads of lessons I'll take away with me, but the main one I'll remember is to never give up, no matter what the challenge, just keep going and you’ll make it in the end.”"
Brown played in the second row for Connacht, Northampton, Brive, Leinster and Oyonnax while his brother, Andrew, is currently with Connacht.